Gearing up for the Big Game? No matter what team you’re rooting for, watching the game is better together. Make it a party by gathering fellow fans for football, food and lots of fun. 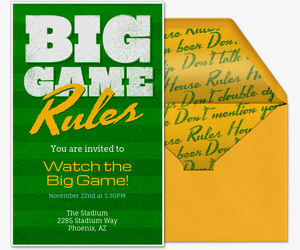 Start by sending out a winning Evite Big Game Invitation. 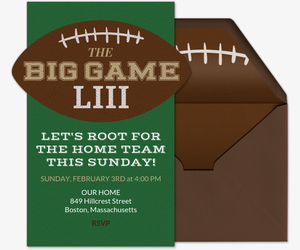 Whether your football party is for football fanatics or guests who are just there for the food, The Big Game invitation gallery on Evite has dozens of free and Premium invitations to kick off the get-together. Once you’ve drafted your pick, fill in the event details and write a custom message for your guests. Encourage guests to come wearing a painted face and team jersey, then let them know what your house rules are -- no channel-flipping or double-dipping! Worried hosting duties will distract you from the game? Stress less by asking guests to bring something to share. Once you’ve created your football party invitation, use our What to Bring tool to ask guests to bring items to share and track what everyone’s bringing. 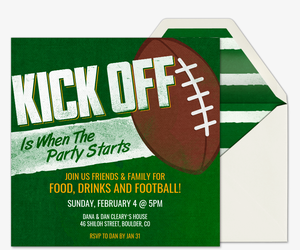 Game Day gatherings don’t have to be a big fuss -- keep it simple by sending our free football party invites. Choose from dozens of digital designs featuring game-time graphics. Planning a boozy bash and want everyone to know it? 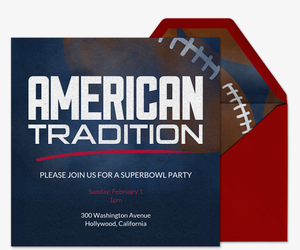 Go for our free keg-inspired “Stupor Bowl” invitation or our free football field-themed “Beers & Cheers” invitation. 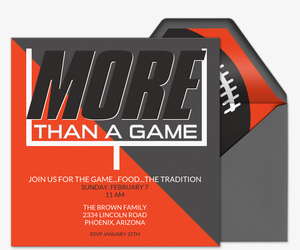 Looking for an invitation that’s all football, all the time? Pick one of our designs featuring photos of stadiums, footballs and more. Or, if you want to represent the season’s top two teams, customize our free, upload-your-own invitations with your own choice of images. 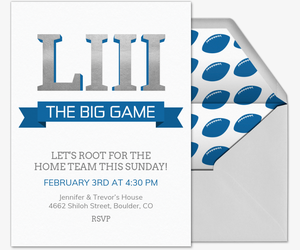 This isn’t your average Sunday, so pick a Premium invite if you want to make sure your game day is super special. Our ad-free Premium Evite invitations and matching envelopes can be purchased for $5 for up to 15 invitations for a smaller crowd, or $12 for up to 50 invitations for a larger one. 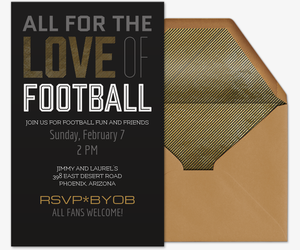 Celebrate our nation’s favorite sport with our Premium “American Tradition” invitation, or share your love of the game with guests by sending our “All for the Love of Football” invitation. Got your own design in mind? Customize our upload-your-own or design-your-own invitations. The Big Game only comes around once a year, so go big or go home. Score everything you need to plan a cheer-worthy Game Day party at Evite's Big Game Party Ideas. Follow our tips on how to fuel football fans with a winning Game Day menu and create football-themed DIYs you can use next season too, including an artificial turf table cover, drinks tub or coasters. Then get ideas and printables for fun and easy off-screen games like football-themed bingo or beer pong. Are you a rookie at planning parties? Get tips from the pros. Our Game Day, tailgating and homegating party guides cover all the basics, from food and drinks to decorations and activities. Rookie at all things football? Check out our Big Game Survival Guide to brush up on your football facts. Game on!